Review - "How Come Boys Get to Keep Their Noses?" 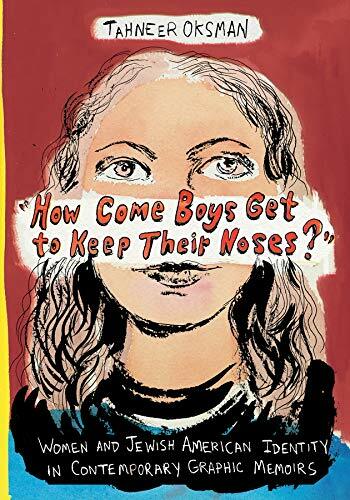 Tahneer Oksman has written an impressive book with an enigmatic title: How Come Boys Get to Keep their Noses? Fortunately, the subtitle elaborates on her thesis: Women and Jewish American Identity in Contemporary Graphic Memoir. The frontmatter hints at the significance of what is to come, for Oksman quotes Nicholai Gogol, the Russian author of The Nose (1835-6). Gogol's narrator muses, "My own nose, which, surely, is, for all intents and purposes, myself" as he searches for his missing nose and then learns that the nose developed a life of its own. As Professor Oksman examines seven graphic novels/memoirs written by "secular" [sic] Jewish women, she explains literary concepts to non-specialist readers and taps into her background in writing and literature. She also emphasizes the books' ethnographic significance. Several pages of colored graphics punctuate the midsection of the 274-page text, and complement the occasional black & white images scattered throughout. These images familiarize the less familiar reader with the visual stylistics of specific authors. For Professor Oksman, these illustrated memoirs function less as art historical artifacts and more as literary creations, yet she acknowledges artistic influences when available. In a footnote, she references a personal communication with Liana Finck, subject of the book's conclusion and author of A Bintel Brief. She notes that Finck attributes her stylistic influences to "Marc Chagall, old Yiddish illustrations and prints, Molly Picon films and the 1937 Yiddish film classic The Dybbuk" (all of which hold prominent places in Jewish tradition albeit it not necessarily in formal religious observance). The bibliography and endnotes are especially impressive and wide-ranging and are useful for further scholarship. She alludes to Sandor Gilman, historian of medicine and author of The Jew's Body and histories of cosmetic surgery--read "rhinoplasty" or "nose jobs" --as well as Henry Roth (and not just Philip Roth), Erica Jong, Maurice Sendek, Irving Howe, Frieda Kahlo, and Sartre (the 20th century existentialist philosopher who contended that anti-Semitic creates Jewish identity) and much, much more. Her erudite approach distinguishes this book from fanzines, blogs or a website synopsis--although, admittedly, some comics fanzines, blogs and websites compete favorably with academic counterparts. This book exists on a continuum with related scholarship in this growing field. The author draws upon Hilary Chute's earlier book on Graphic Women (see review)but circumscribes her topic yet expands the depth via wide-ranging references. In contrast to Hilary Chute's more global perspective, Oksman casts a narrow net and whittles it down even further. She reports exclusively on Jewish women comics/graphic novel creators--but only if they are "secular Jews" who came of age in what she labels a "post-assimilationist" society. It is unclear how she defines "secular" and it is unclear how she expects "non-secular" Jewish women to relate to this medium--or to Oksman's scholarship itself. In truth, it is a bit off-putting to find "non-secular" Jewish women marginalized in a book about marginalized Jewish women, especially since there are so many varieties of "non-secular Jews" who connect to Jewish tradition and who might be interested in her subject matter. In her favor, she concludes her book with an examination of Liana Finck's 2014 publication, A Bintel Brief: A Love and Longing in Old New York. The original Bintel Brief was a popular advice column from The Jewish Daily Forward, a widely-read, left-leaning Yiddish daily that mutated into a weekly English edition many decades later, in 1990, and is now available online (www.forward.com), sans the Bintel Brief letters. Bintel Brief, translated as "a bundle of letters," was the forerunner of newspaper advice columns such as Dear Abby or Ann Landers, but represents much more. The Bintel Brief letters offer an unparalleled lens into the challenges of immigration and integration (or non-integration) in an unfamiliar American setting. We can infer that members of the earliest generation of male comics creators were far-removed from the "post-assimilationist" mentality that interests Oksman. Most were sons of Eastern or Middle European immigrants. Some grew up in Yiddish-speaking households. All came of age after Adolf Hitler claimed control of Germany, aspired toward world dominion, and stripped Jews legal rights, property, education as basic human dignity. Those early creators had limited opportunities even in America, not just because they were Jewish at a time of extreme anti-Semitism in America, but also because they were teens and young adults during the Great Depression, when employment opportunities were few. Those young men were the creators of the "superhero stories" that have enjoyed a major renaissance in post-9/11 American society. Many wonder why men who created comics left a legacy of triumphalist superheroes that symbolically "shoot for the stars" (or at very least leap over tall buildings), while Oksman's female graphic novelists and memoirists do the opposite: they produce personal "pathographies" that tell of their travails, psychological and otherwise, and reveal their weaknesses. Their biographies embed tales of psychopathology. Oksman offers an easy explanation. Oksman sees this anti-triumphalist approach as a deliberate maneuver by female graphic novelists, who sought to distance themselves from the superhero genre linked to Jewish male comics artists and writers and specifically strived to leave a different legacy than their male predecessors. An ego psychologist might argue that Professor Oksman dissects her "subjects" [the comics creators and graphic memoirists] as if they were lying on a couch rather than sitting at a drawing table--but that is often the case with literary theorists and critics. Given that she is exploring "pathographies" that revolve around psychological wounds and reactions, Oksman's approach is valuable, especially since it is wedded to a much larger discourse about race, religion, gender, identity politics, culture at large, and a much larger and longer literary history. Perhaps in her next book, Professor Oksman might consider contemporary female fictional characters in comics, notably Batwoman, who was reimagined as Jewish Lesbian, to spite the anti-comics and homophobic crusade of psychiatrist Dr. Fredrik Wertham, author of The Seduction of the Innocent (1954). Or explore Felicity of Arrow and how this temper-tantrum throwing computer genius and CEO fits into the mold--or breaks the mold--of fictional female Jewish characters in comics and elsewhere. Felicity's Jewish mother, the ever-annoying, always--clinging, Barbie doll look-alike who works as a Las Vegas cocktail waitress, deserves a separate study, as does Kitty (Katherine) Pryde of the X-Men and fictional Israeli comics characters, such as the super-powered Sabra and more. Oksman would be well-prepared for this challenge. Until then, this book is recommended for mental health professionals and social scientists as well as for scholars of comics, literature, culture, ethnic studies and Jewish studies.